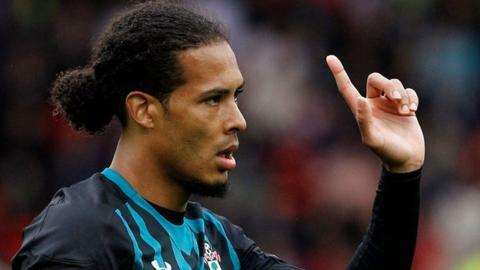 Southampton defender Virgil van Dijk has hinted he would still like to leave the Premier League club when the transfer window reopens in January. The Netherlands centre-back, 26, handed in a transfer request in August and said he wanted to move to Liverpool. Southampton refused to sell the former Celtic player, who returned to their starting XI for the first time this season on Saturday. "Halfway through the season, maybe we can see what's possible," he said. Saints manager Mauricio Pellegrino ordered Van Dijk, who signed a new six-year contract in May 2016, to train alone in July amid speculation over his future. He made his first appearance of the season when he came on as a substitute against Crystal Palace last month, and then started Saturday's 2-1 defeat at Stoke. Liverpool ended their interest in the player in June after Southampton said they were going to report them to the Premier League for making an alleged illegal approach. However, Van Dijk - who was also linked with Chelsea and Manchester City - says he has "no regrets" about asking to leave Saints, who signed him for £13m in September 2013. "I wanted to go one step up, but eventually Southampton did not want to let me go," said the Dutchman. "You're a professional, so now I'll give everything to the club."